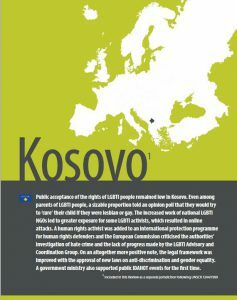 Last year in Kosovo, equality laws and better implementation of existing legislation in regard to anti-discrimination laws were cited to be very important by an advocacy and coordination group for LGBTI rights. In addition, as part of the annual enlargement update, the EU Commission stressed the importance of commitment by local leaders, in regard to LGBT issues. Two local NGOs conducted a research on health and social care for LGBT people in Kosovo; through which they found troubling results, where those surveyed tended to be very homophobic. The NGOs made recommendations to relevant institutions. On May 17th, a Kosovo MP named Gezim Kelmendi (Fjala Conservative Party) said that marches like the IDAHOT march should not be allowed, because “homosexuality is a disease that is scientifically proven, and a leading cause of the destruction of families and of population decline.” Investigations were not initiated by the Assembly, although it was requested by NGOs. However, the IDAHOT march on May 17th, 2016 was very well executed. Many supporters and LGBT persons alike joined; together with Kosovo’s President, and former President- who were most noted among other figures like Ulrike Lunacek, and representatives from the government and CSO. This year, in its annual enlargement package, the European Commission said that positive statements by political figures should be followed up by adequate resourcing and commitment. Support from the President of Kosovo in last year’s march was noted; but the report stated that implementation of human rights laws requires more resources and political commitment at local level. In regard to bias- motivated violence, 4 cases were brought to NGOs attention last year. Of these cases, one was taken to court and that was a case in the city of Ferizaj where 2 LGBT rights NGO workers were attacked. The Ferizaj Basic Court found one of the accused men guilty of incitement to hatred and bodily injury in September; he was given a five month prison sentence. The court found the second defendant not guilty of incitement to hatred but guilty of bodily injury; his four month sentenced was suspended for one year. The Equal Rights for All Coalition (ERAC) conducted a research which was published in November; where it concluded that not all social workers had a clear understanding of the underlying issues for trans people. However, overall they appeared to be open-minded and showed a conviction in providing services for all those who would be eligible. The report states that there are gaps to be filled which may improve the services that trans people receive. On December 13th, a roundtable on the treatment of LGBTI cases by the judicial system was held, and attended by representatives from the Ombudspersons Office, the Office for Good Governance, police prosecutors, and court officials.